$160.00 OFF! Find Quickbooks Premier 2016 on sale this week at Amazon. Amazon already has all of the 2016 versions of QuickBooks on sale and regardless of the number of seats you need, you won’t find a lower price on QB 2016 at the moment. Not only does Amazon have the best deals on Quickbooks Premier software, with up to $160.00 off per license, but they also have the digital version that lets you download it vs. waiting for the box to arrive. If you need the boxed version, it’s usually listed for about the same price and you’ll also get shipping for free. See site for offer details and prices (which can vary across versions sold). Just keep in mind that sale prices are subject to vary or change without notice. $150.00 OFF! Save $150.00 on the new QuickBooks Premier 2016! 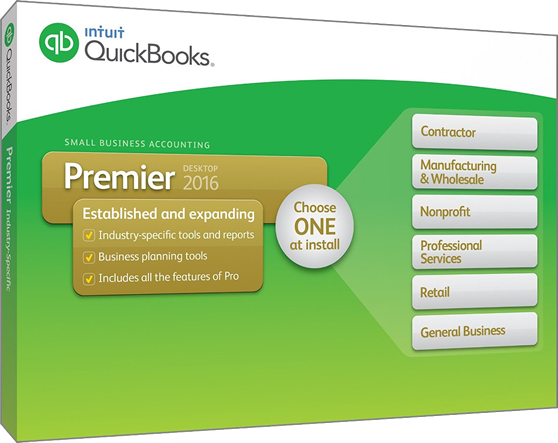 The all new Premier 2016 has just been released and we have secured a great deal to help you save $150.00 on your purchase when ordering at the official QuickBooks Store at Intuit.com (it’s not often that we see a manufacturer discount their software immediately at a new product launch). Just follow the above link and you’ll see the savings automatically applied to your order (the instant coupon code is embedded in the link). Just act fact as this offer will expire on April 30, 2016. $100.00 OFF! Save $100.00 on the Canadian version of Quickbooks. If you are in Canada an require the Canadian-specific version of Quickbooks Premier 2016, then this instant offer will cut your order by $100.00 when purchased at www.Intuit.ca. Just follow the above special offer link and you’ll see the new lower price listed on the product page before you add it into your shopping cart. A maximum of one discount per order can be applied. Expires on April 30, 2016. Also for Canadian Quickbooks orders, we recommend that you take a look at the sale price now listed at Amazon.ca. All Amazon orders in Canada will qualify for free standard shipping. Where can you download and try Quickbooks Premier 2016 for free? Unfortunately the 2016 versions of Quickbooks Premier are not available in free trial versions. Only Quickbooks online editions are available for trial (credit card required). The only way to try Premier is to buy a full or upgrade license key. However, Intuit offers an unconditional money back guarantee for 60-days from the date of your purchase to request for a refund if you are not satisfied with your order. If you placed your order in the United States, call Intuit at 1-888-729-1996 to begin the refund process with a customer service agent. Make sure you have your order information and receipt ready as it will be needed to process your refund. When will Premier 2017 and all the 2017 versions of QB be released? Quickbooks has a very predictable release cycle and which has not changed in a number of years. Around the end of September you should start seeing some of the new features being announced. Then in the last week of September, resellers like Amazon and Staples will open pre-orders and the new features will be announced. Usually by the end of the month, they will start shipping the new 2017 products. If you’re able to hold out until September, we recommenced you make your order at Intuit.com because they have been offering free upgrades to the new in the past to all customers that purchase the outgoing one (so you basically get two licenses for the price of one).